If only. That is my takeaway from seeing Suicide Squad. It could have been great, if only. It would have been great if only. 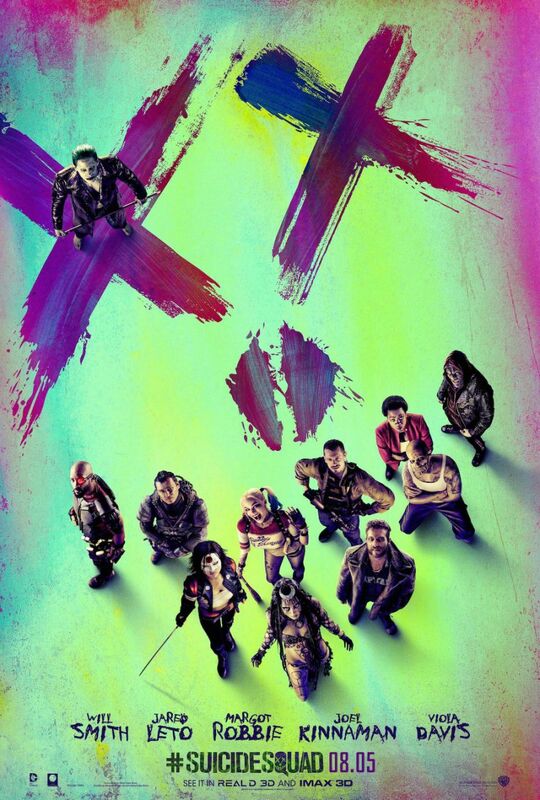 Despite the films best efforts, Suicide Squad is still a very entertaining movie. But there are some glaring flaws that consistently detract from the experience. What is shocking is how good the movie is considering how obvious some of its missteps are. Suicide Squad does not get off to a good start. It opens with some highly artificial character introductions that interspersed with Amanda Waller outlining her Task Force X plan. It is poppy and high energy, but even in just the context of the first 20 minutes it doesn’t fit. While it quickly introduces the team, it doesn’t really give them a context. Deadshot is a hit man with perfect marksman ship who was caught by Batman. Harley Quinn is the Joker’s lady friend who was caught by Batman. El Diablo is a pyrokinetic, Killer Croc is a human Crocodile, and Captain Boomerang is a murderous jewel thief with a signature weapon. Then about 15 minutes later is introduces everyone again. It feels like they chopped up the first act to get to the team faster and to make it feel more like the trailers. It ends up feeling disjointed and unfinished. After that, though, things really pick up. The team is quickly pressed into action, as a mystical force is attacking the fictional Midway City and that requires their skills and their expendability. Things start to feel more organic. Initially their mission is to rescue a high value individual from the city, afterwards they must try to stop what they are told is a terror attack. Nominally the villain is the Enchantress and her brother. She began as part of the team, an extra-dimensional entity that had possessed archaeologist June Moone and controlled by Waller, who has her heart. But she manages to break free and attempts to destroy human civilization. While Enchantress is the antagonist that they actually fight, but the true villain of the film is Waller, whose arrogance and disregard for other people endangered the world. There is nothing redeemable about here. Other than the choppy, nigh incomprehensible opening, the other big flaws are the back half of the Squad and the Joker. This is the Deadshot, Harley and El Diablo show, the other team members are just there to fill out the ranks. Captain Boomerang steals every scene he’s in, but he doesn’t really have anything to do. The same is true of Killer Croc and Katana, who doesn’t even get her own intro. Even Flagg, the leader of the team and the person who should be the emotional center of the movie, gets pretty short shrift. All of that really isn’t a big problem, but it certainly feels like the movie would have been better if only they had done a little more with those characters. Especially Flagg, who was in a relationship with Moone. He has an emotional connection to the mission that is largely ignored for the bulk of the film. The Joker stuff is harder to reconcile. I don’t hate Jared Leto’s take on the character, despite the reports of his obnoxious, to put it lightly, antics on set. He plays the Joker as some sort of trashball gangster, like a green haired Scarface. But even though the character is in all of about 10 minutes of the movie, that feels like about twice as much as he should. His storyline with Harley, where the Joker spends the movie trying to free her from prison and then the squad, goes nowhere. It’s just kind of there, distracting from everyone else. Harley is one of the best parts of the film, but the stuff with the Joker doesn’t add anything to her portrayal. It is a wasted, pointless subplot. In only they could have provided a reason or some resolution to that plot it would have add some much need depth to the movie. Yes, the movie stumbles out of the gate. It wastes time on bad characters and plots and ignores more interesting ones or at least the chance to make other characters more interesting. But despite all of that, the film still delights. There is enough emotional connection to the characters to make the viewer care and the action is largely fun. It isn’t quite earned with El Diablo refers to the team as his family, but that thought is not echoed by anybody else in the film. It feels like a movie that bears scars from reshoots and editing, but the core of the film is still a strong action movie.